Partnerships between youth, parents and health care professionals can improve outcomes for children and youth. However, best practice evidence to support partnerships between youth, parents and researchers in child-oriented research is less robust. Methods for including parents and youth in health research in the Maritimes vary widely, with little infrastructure available to guide meaningful engagement. Mechanisms and processes are urgently needed to support the inclusion of parents, children and youth as partners in child health research. The overall goal of our project is to co-develop a strategy, with input from parents, patient engagement experts and members of the research community, to support parent-researcher partnerships in patient-oriented research in the Maritimes. Our project outputs will build capacity for patient-oriented research in a child health context. Current evidence indicates patient involvement in health services research contributes to the creation of more accessible and acceptable services and improved relevance and acceptance of research findings. However, the literature examining youth and parent engagement in health care interventions is not well defined or organized and has yet to be systematically reviewed. This project will map the existing evidence describing parental engagement in designing healthcare interventions for pediatric tertiary care. ​This multi-site study will determine whether clinicians include the essential content and process elements in discharge communication with caregivers. The study will also identify communication strategies and document caregiver recall and comprehension. The data collection methods used will include non-participant observation through the use of video recording, as well as chart audits and caregiver follow-up. ​This study is exploring the process, content, and barriers and facilitators of discharge communication in the context of pediatric emergency care in 10 Regional/Community emergency departments across Nova Scotia. In the upcoming months we will carry out one emergency clinician focus group, as well as 6-12 interviews with caregivers at each site. 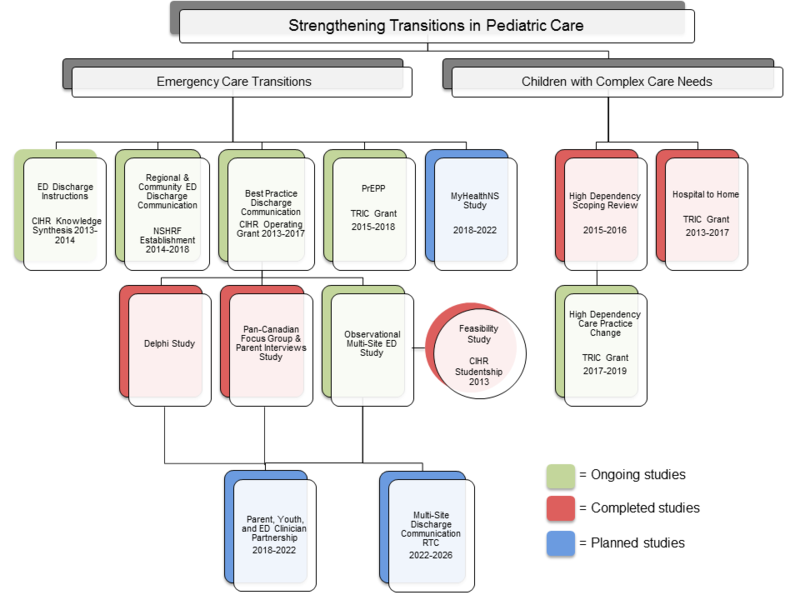 ​This research is examining the process and content of discharge instructions in emergency pediatric care at 6 emergency care sites across Canada. At each site, one focus group with emergency room clinicians (8-12) as well as 12 interviews with caregivers, and 2 interviews with adolescent girls will be completed in the upcoming months. Knowledge Translation (KT) is the application of knowledge to help improve health care services and the health care system. Bridging the gap between research and practice is essential to ensuring that Nova Scotians are receiving the best health care possible. The aim of this interactive curriculum is to build awareness of and capacity in KT activities in Nova Scotia and to provide the opportunity for research and decision-makers to work collaboratively. A series of workshops will be held to engage participants from different sectors of the health care system in Nova Scotia in a facilitated dialogue about KT. Local experts in KT will share current best practices regarding the use and implementation of KT science and practice. The REAL Change Intervention Workshop is funded by the NSHRF and aims to bring small teams of stakeholders in the Nova Scotia health system and public health sector together to design and implement a practice or policy change. The teams benefit from the support of knowledge translation (KT) experts and KT coaches to guide through a systematic approach to designing and evaluating their practice or policy change. This support ensures their practice or policy changes are successfully implemented and have a lasting impact on population health. ​This Delphi Study identified content for inclusion which will aid to ultimately develop best practice guidelines for discharge communication for caregivers of children who present to the emergency department. Using a delphi study technique, emergency department physicians and nurses from across the country were surveyed to come to a consensus on the top 5 content items which should be communicated to all caregivers across six different illness presentations.